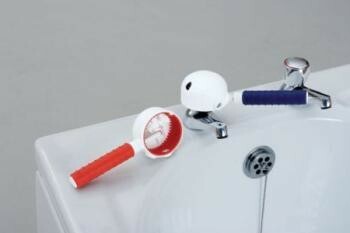 Attractive, easy to use tap turners that can be used on crosshead and crystal taps. The soft textured handles provide a comfortable and secure grip whilst in use. Attractive, easy to use tap turners that can be used on crosshead and crystal taps. The soft textured handles provide a comfortable and secure grip whilst in use. There is no installation required due to the screw handle that tightens the grip on the tap.Colour coded so that those with limited vision can identify the required tap.